The IBM EXP700 expansion enclosure allows you to add up to (14) 3.5" disk modules to your DS4300 (FAStT600), DS4400, and DS4500 storage servers. 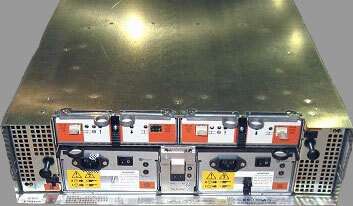 The EXP700 operates at 2Gbps with the above controllers. It will auto-negotiate to 1Gbps mode when placed in a loop consisting of EXP500 enclosures and legacy FAStT200 and FAStT500 storage servers. Values above are attained by using Storage Manager 8.0 or later, using all internal storage server drive bays, and replacing all 10-Bay EXP500 arrays with 14 Bay EXP700 arrays.